Clematis are vining perennials. The flowers are of various forms, such as urn, saucer, star and bell shape. The flower sizes vary from one-fourth inch in diameter up to 4 inches. Colors are available in various shades of blue, purple, red, crimson, white, and pink, and also can be bi-colors, with various markings or patterns. Now, clematis may have many uses in the landscape. The clematis supports itself with its tendrils that twist around arbors, fences or other supports. Many gardeners will use the large flowering hybrids as specimen plants. They'll display them on trellises, posts, old tree stumps, walls and pergolas. The clematis flower lasts up to 10 days when cut, and can be worked into floral arrangements. Types of Clematis- There are three basic types of clematis; ones that produce flowers on this year's growth (new wood); ones that produce flowers on the previous year's growth (old wood); and those that produce flowers on both new and old growth. Some clematis varieties bloom in the late spring and early summer, while other varieties wait until late summer and early fall. The second and third types of clematis, which flower on old, or old and new growth, are best pruned in early winter or spring. Prune lightly, which involves more judgment. Prune to reduce the plant to a manageable size or to revitalize. Trim lightly when it is necessary to retain vines. Light pruning is always preferred for clematis that flower only on old wood, because only a minimum of buds are removed. Location- Clematis require a site that will receive at least one half day of direct sunlight. This helps in bud and bloom production, and lowers susceptibility to crown rot. Young clematis are extremely susceptible to crown rot, which is a disease. Crown Rot can usually be prevented by treating the plant with a garden or flower fungicide throughout the growing season. Particular care must be exercised in preparing the soil for clematis. The soil mixture must be well-drained and aerated. For best results, dig a hole much larger and much deeper than the root system. Mix generous portions of peat moss with the soil. Dolomitic limestone should be added to raise the pH of acid soils. You'll want to use about 3-1/2 ounces of dolomitic limestone per bushel of soil. Clematis like to have a cool root zone. It's important to plant the clematis a little deeper than most plants. The crown and sprouts should be covered with about 2 to 3 inches of soil. 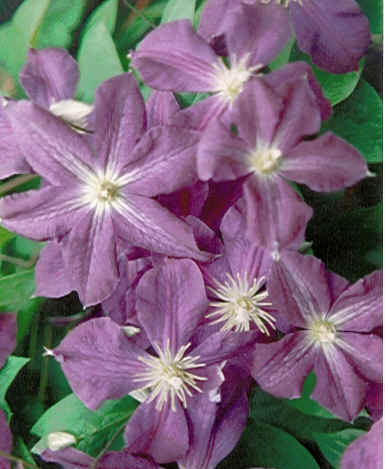 Use a mulch around the base of the clematis vine to retain moisture and to control weeds. Or plant clematis by shrubs, perennials, or annuals that will shade the root system. The plants are also susceptible to any root disturbances. These can include animals digging around the roots, or growing in a low spot where water may collect. Handle with great care when planting and avoid breaking or damaging the plant. .Give clematis time to get a good root system established before you expect flowers. This may take a year or two. Double flowering varieties may take a bit longer. After Planting- Clematis need water, but not too much. Feel the soil between waterings. Plants that are too wet can be affected by crown rot. How often clematis need to be watered will depend on the weather. Moisture control in the root area is important, since the roots cannot tolerate hot, dry conditions. Soak the soil once a week to adequately moisten it to a depth of 8 to 10 inches. Clematis need fertilizer to sustain good growth and flowering. You'll want to top dress the soil at the base of the vine with 2 to 3 tablespoons of 5-10-5 or 4-10-4 in late March. Repeat this application in mid- July. This can supplemented with a water soluble like Miracle-Gro. "Henryii"- Very large white flowers in June and September. No winter pruning. "Jackmanii"-The most profuse blooming dark purple. Blooms June, July, and September. Prune hard in winter. Montana - Montana Clematis are among the easiest to grow. They are vigorous growers and strong bloomers. All bloom in May and June. "Marjorie" is a very heavy bloomer with light pink flowers that have a light vanilla fragrance. No winter pruning. "Mrs. Robert Brydon"- A strong, free flowering grower with bluish-white 1" flowers in a large cluster. This is a heraclefolia type which is very hardy and grows like a bush. Another non-clinging or bush type is "Alionushka", which has semi-nodding mauve pink flowers. Also new for 2002, "Arabella", is also non clinging and very free flowering with round semi-nodding rosy purple flowers. Tangutica- Another fast growing, vigorous vine that blooms from July to September. It has yellow lantern or bell shaped flowers and also has very interesting seed heads. Prune halfway in winter. Texensis- "Pagoda" has a pretty pink, nodding flower. It is a later flowering (July-September) and can be trimmed in late winter as the buds start to swell. Viticella- Clematis viticella is a very vigorous species with a wide range of color, size and shape of flowers. They bloom from mid summer until autumn. Most are trimmed in late winter or early spring. We have two larger flowering varieties- C. viticella "Etoile Violette", a vigorous prolific bloomer with 3-4" purple flowers, and C. viticella "Polish Spirit", rich purple-blue 3-4" flowers that can be used as a cut flower. Two smaller varieties are C. viticella "Alba", a free flowering small white bloomer, and C. viticella "Kermisina", lots of small bright red flowers. These should be pruned hard over the winter. "Mme. Julia Correvon" is a very vigorous grower and has a red 3" flower in late season. New for 2001 is C. viticella "Abundance"- A very free flowering variety. The semi-campanulate flowers are rosy wine color and 2-3" in size. Anthers are yellow. Blooms July thru September. New for 2002 is "Betty Corning", a lightly scented 2" nodding flower of light blue.